Deplar Farm is a converted sheep farm in the Fljót Valley, on Troll Peninsula, way up in northern Iceland, about as far north as you can go before you hit Greenland. It is a fairytale place, where brilliant hanks of wild, wheat-colored grasses sprout from the rolling tundra, thick and glossy as the blonde manes of the Icelandic horses grazing nearby. Plump sheep dot the hills, where there are few trees, since the Vikings cut them down centuries ago, and they’ve never grown back. When it snows, the sky turns white and melds seamlessly with the edges of the earth, which can be disorienting, until you adjust to feeling like you’re on the inside of a ping pong ball. But no matter what the weather—which is beautiful, much of the time—the mantra at Deplar is this: “There is no such thing as bad weather, only bad clothes.” And guests don’t need to worry. The extremely knowledgeable, well-credentialed and charming guides will get you kitted out so that you can take a long walk on a black lava beach strewn with chunks of blue ice from a glacier that just moved in. Or go heli-skiing, from either of two helipads, where you may be the very first human to ski down a remote slope. They’ll take you whale watching in the fjords, fly fishing, fat-bike riding, hiking, or even surfing— in a wetsuit —nearby! Nothing is impossible at Deplar, where the guides create unique and thrilling bespoke experiences. And, at the end of an active day, guests unwind in the beautiful Nordic spa (with an Isopod flotation tank), and take a hot/cold plunge in the Viking sauna. 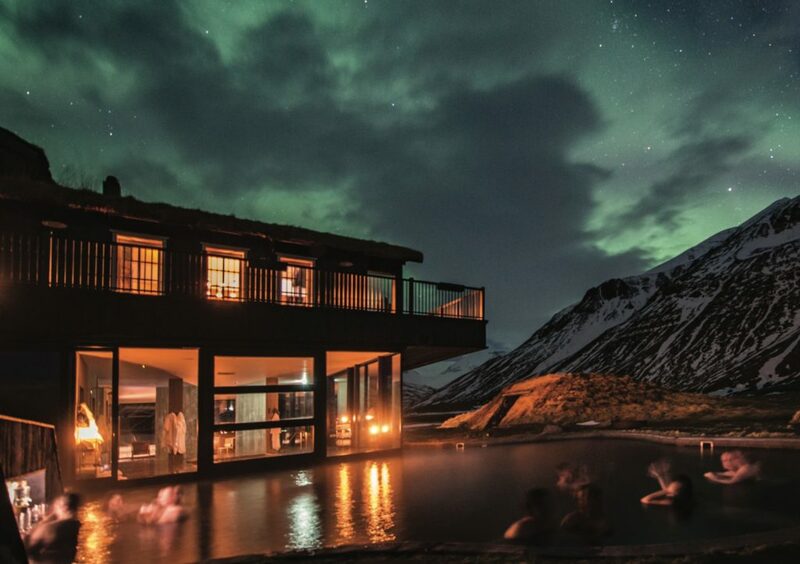 Even if the surrounding mountaintops are covered in snow, you’ll want to soak outdoors in the geothermal pool (90 percent of Iceland is fueled by geothermal energy) with a refreshing glass of Icelandic beer, cocktail or hot toddy in hand, because, if the sky is clear, you’ll be enveloped by the Aurora Borealis (Northern Lights). The award-winning chef serves up stellar cuisine, in a modern dining room with natural elements like stone and wood, along with local delicacies like Icelandic lobster, and Skyr, the best yogurt you’ve ever had.